big accomplishment for us as we’ve been talking about relocating for a while. Instead of waiting until everything looked perfect, we knew that taking a leap of faith and trusting God would outweigh any fears we had. Transitioning from living in one state all of our lives to quickly picking up our life and leaving was a bit stressful. One of our main missions is grow and expand our way of seeing life, so moving had to happen. I knew that with this move, I had to create new goals for myself to accomplish. At first, I was literally drilling myself. I had to get even more organized then before, find different ways to network/meet new people, and try my best to grow our businesses. With that being said, you can imagine the pressure that I placed on myself so it really started to take a toll on my mental and physical health. I instantly decided that I had to put my health at the fore front, because without it I wouldn’t even be able to achieve these goals. The thing about my relationship with fitness is that I usually have to feel motivated to really get up and work out. I knew the perfect way to start off would be to get some new gear, because who says you can’t be cute while exercising? 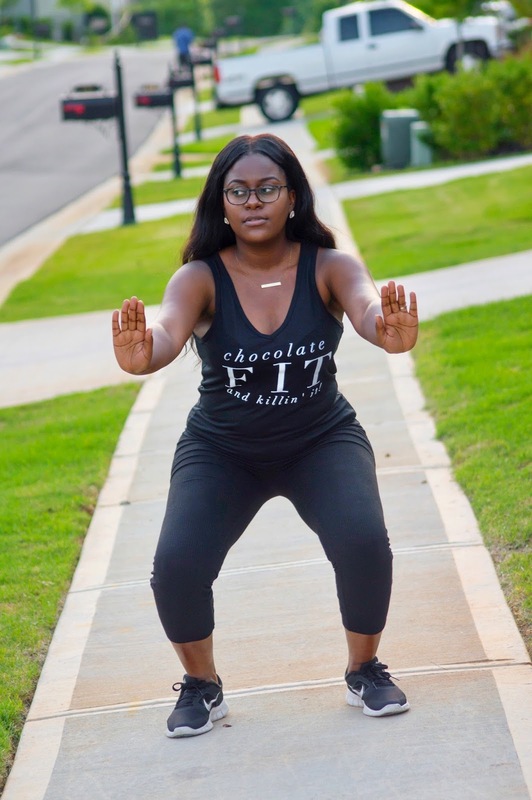 The tee I’m rocking sold by Natural & Fit Designs is the bomb because not only does the saying on the shirt give me life but the fabric is very breathable, which is perfect for capturing sweat. I also really enjoyed sporting it during my evening work out because I truly love what the company stands for. Natural & Fit Designs was created to reflect the founder Tara’s feelings about black women, working out, natural hair, and much more. So how exactly has introducing working out changed me so far, you might ask? It’s definitely pushing me both mentally and physically. While in college I definitely packed on some pounds and just as it usually does, the weight gain crept up on me. I basically incorporated little to no physical activities into my lifestyle, so working out now has been tough. Instead of beating myself up for not being able to complete more strenuous work outs and I’ve decided to take it all one step at a time. I’ve mainly been focusing on my stomach and glute region with exercises such as squats, reserve twists, and leg lifts. I’ve also been pushing myself to keep going and not give up the fight because I truly believe in self perseverance. Cheers to getting fit, not only for an awesome body but to improve your health! Be sure to visit Natural & Fit Designs and use the code MICHELLESHOPS for a discount off of your fabulous fitness gear. Lets make 2017 the year where we achieve our personally goals and prioritize our mental/physical health!